Flying in tandem with the comet some 356 million miles from the sun, Rosetta and its quarry are now moving beyond the range where the spacecraft’s solar panels can generate enough energy to power all of the probe’s instruments and subsystems. Instead, mission managers decided to move Rosetta in for a descent to the surface of 67P/Churyumov-Gerasimenko where it will forever rest within a half mile or so of the small Philae lander it dropped off in November 2014. Designed to anchor itself in the comet’s icy crust, Philae famously bounced off, bounced again and ended up, two hours later, on its side in what its camera showed was a heavily shadowed, extremely rocky area near what appeared to be the side of a cliff. In August, Rosetta’s powerful camera finally found Philae, beaming back a photograph of the wayward lander lodged as expected in rocky terrain. Now, Rosetta will join its partner in science, collecting data from within a few hundred feet of the comet’s surface and beaming it back to Earth before impact around 7:20 a.m. EDT Friday (GMT-4; plus or minus 20 minutes). 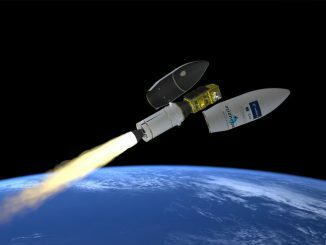 The final rocket firing to set up the terminal descent was expected about 14 hours before impact. At that point, the approach velocity was expected to be a sedate .67 miles per hour. By the time it reaches an altitude of about 1.2 miles above the surface, the comet’s weak gravity will have accelerated the spacecraft to about 1.3 miles per hour. 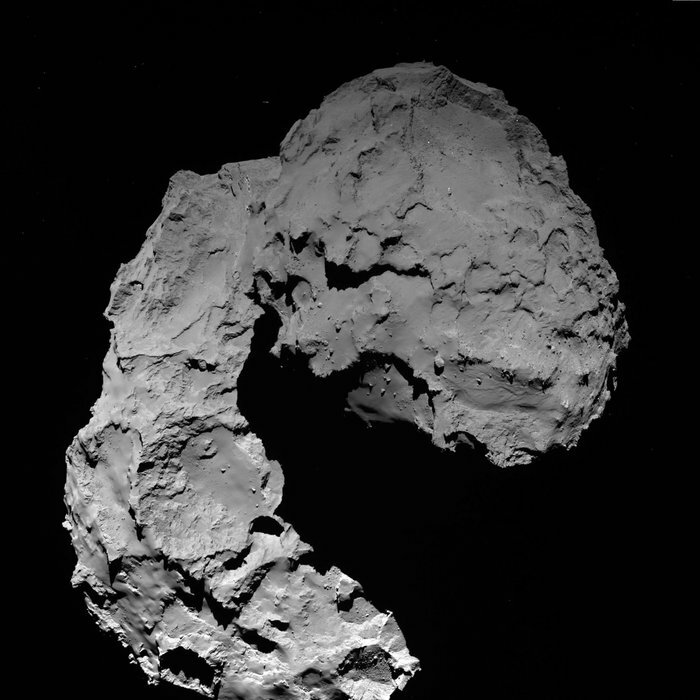 Finally, Rosetta will hit the surface at about 2 miles per hour, or walking pace. But that’s more than fast enough to doom a spacecraft that was never designed for landing. Rosetta’s long solar panels will collapse or bend to the surface and instrument booms likely will crumple as the spacecraft hits and then rebounds in the comet’s modest gravity. Software was loaded earlier to shut the spacecraft’s systems down at the moment of touchdown, switching all of its systems to standby. 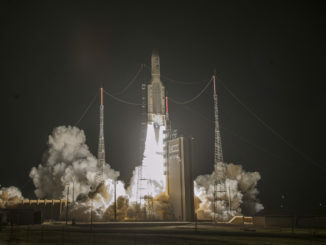 Even if its radios remained on, Rosetta would not be able to continue operation. And so, after a voyage spanning more than 12 years and nearly five billion miles, one of the most scientifically productive space missions ever launched will come to an end with Rosetta and the Philae lander forever moored to 67P/Churyumov-Gerasimenko as it continues its lonely trek around the sun. Discovered in 1969, 67P/Churyumov-Gerasimenko circles the sun in an elliptical orbit extending nearly 500 million miles from the sun at its far point — beyond the orbit of Jupiter — to a point between the orbits of Earth and Mars some 115 million miles from the sun. The comet measures a few miles across and rotates every 12.7 hours. Made up of material left over from the birth of the solar system 4.6 billion years ago, 67P/Churyumov-Gerasimenko is a frozen remnant of the material used to build the sun and its retinue of planets, a representative sample of the countless small bodies that may have seeded Earth with the organic compounds necessary for life. Rosetta’s observations have revolutionized comet research. Contrary to some pre-arrival theories, Rosetta found that the water locked up in 67P’s icy crust is not the same type as found in Earth’s oceans, indicating comets may not be responsible for building up the planet’s oceans through countless impacts. Analysis of surface elements and compounds shows 67P is, in fact, an ancient body, a relatively dry, highly porous “rubble pile” riddled with organic compounds, including the amino acid glycine, which can form in the absence of water. During 67P/Churyumov-Gerasimenko’s approach to the sun, Rosetta observed chunks larger than a yard across being blown away from active regions. It also has observed large pits as wide as a football field and equally deep, with walls made up of so-called “goosebumps” about 10 feet in diameter that may be the original building blocks of the comet. During its descent Friday, Rosetta will look into one of these pits with its high-resolution camera to learn more about the intriguing structures. 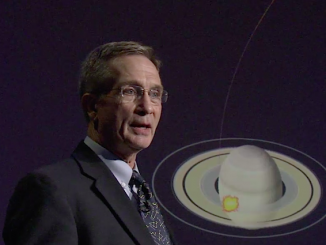 “We are desperately waiting for the last scientific data coming down from Rosetta,” Accomazzo said. “It’s a unique opportunity to observe the comet from very, very close distances. Instruments will be able to sniff the environment around the comet from a few hundred meters. Launched nearly 13 years ago, on March 2, 2004, Rosetta carried out four flybys of Earth and Mars to pump up its velocity enough to move out into deep space on a trajectory to reach 67P/Churyumov-Gerasimenko. The mission plan called for catching up with the comet near the outer reaches of its orbit so Rosetta could follow it into the inner solar system and back out again. By the summer of 2011, after flying past two asteroids, Rosetta was too far from the sun for its solar arrays to generate enough electricity to power all of its instruments and subsystems. At that point, flight controllers ordered the spacecraft to put itself into electronic hibernation, shutting down all non-essential systems, including its radio. For the next two-and-a-half years, Rosetta flew in silence, constantly closing the gap with 67P/Churyumov-Gerasimenko. Finally, on Jan. 20, 2014, Rosetta woke itself up and phoned home, ready for the final leg of its long space odyssey. 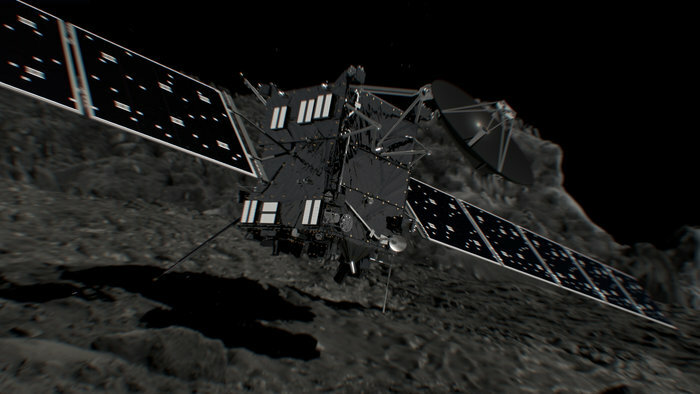 Rosetta finally matched orbits with its quarry on Aug. 6, 2014. Philae was dropped to the surface three months later, on Nov. 12.